Snackadium shot from 2017. Photo by Jen DeMayo. Snackadium by James Grimaldi. Happy Vortex Y’all! The Superbowl is on Sunday. I don’t really know who is playing but I will nevertheless eat nachos for dinner. 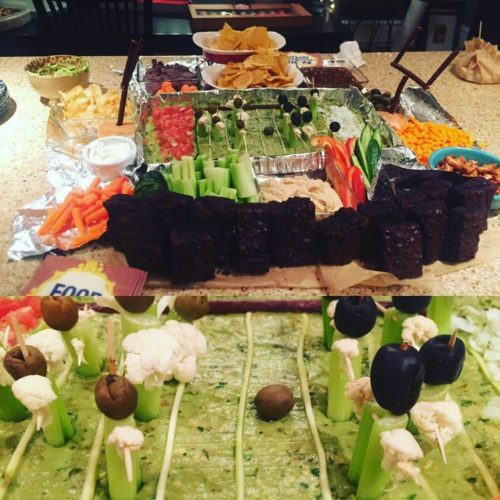 Anyway, this means many of you might be engaging in some ambitious pre-game prep such as building a Snackadium (see photo) and/or mashing dozens of avocados. I am here for all your snacking goals. Aside from decimating the chip aisle what else are we doing this weekend? Tonight. Maybe go see the Folger’s new production of Nell Gwynn? The play, by playwright Jessica Swale and commissioned by Shakespeare’s Globe tells the story of Nell Gwynn, an orange seller turned actress who became the mistress of King Charles II and a folk hero. The show begins at 7:30 p.m. and will run through March 10. Tickets are available here. Friday, all are invited to Capitol Hill Arts Workshop at 6 p.m. to attend the free opening reception for Lenora Yerkes, the recipient of the 2019 Gallery Artist Residency, a six-week paid residency January 7 through February 16, 2019 in CHAW’s gallery. Lenora’s Circle Story relocates her home studio into the CHAW gallery where she will work and display her daily drawings, collecting over the length of the residency to form a narrative experience. Lenora will work in the gallery on Tuesdays, Wednesdays and Fridays beginning January 7th from 5-8 p.m. and on Saturdays between 12 and 3 p.m.
Saturday is Groundhog Day and there is no better way to celebrate rodents that by participating in a neighborhood cleanup. Each month, neighbors gather around in various parts on the Hill and pick up trash for an hour. At 9 a.m., groups will meet at either Chick Fil-A on Maryland Avenue, the 7-11 at 1501 Independence Avenue SE, or Fulcrum Properties, 1328 G Street SE. At 10, meet up at Atlas Vet or Trusty’s. Everyone is welcome to stop by Fulcrum after the clean up for some well-earned treats. Participants will be provided with gloves and trash bags. Saturday is Ice Yards at Yards Park and the weather this year will be perfect for this celebration of all things Brr. If I recall, last year the event took place during that weird February heat wave so this year the vortex arrives just in time. This adult only ice fest features multiple bars with cocktails and local brews, live music, ice games, and axe throwing station and an inflatable jousting pit?? (one of you will send me pics of that right?) There will food available for purchase. All this fun can be yours for the cost of a $10 ticket which includes one beer or wine ticket. This year they have added a Polar Bear Plunge to raise money for the Special Olympics of DC. There will be two pools available for the bravest, craziest souls who have raised at least $100 for the cause. Sunday, Capital City Symphony performs Songs of the Eternal, a concert featuring a program of compositions intended to uplift and inspire. The works range from those by everyone’s favorite 12th century nun and mystic Hildegard von Bingen and 20th century’s Charles Ives. The concert will be conducted by the assistant conductor Tiffany Lu. Tickets are $0-$25 and the concert begins at 5 p.m. at the Capitol Presbyterian Church.